Laser tattoo removal has really come a long way in the past decade, and can now reliably be used to remove old unloved tattoos without the worry of severe pain and scar tissue. HOWEVER, be aware that laser removal technicians are no different from tattooers, in that just because they offer a service does NOT mean that they are qualified to do a good job! Plenty of laser removal clinics use out-dated lasers, or have under qualified technicians that will severely burn and scar you at worst, and simply fail to achieve any removal of the old tattoo at best. 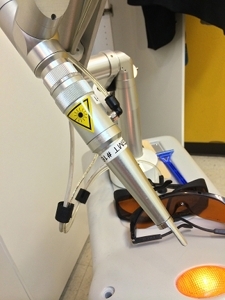 Do yourself a favor and choose your laser removal professional CAREFULLY. * Remember that with photoshop, anyone can have a stunning (FAKE) portfolio of “before and after” pictures. Get recommendations from tattooers who have a good relationship with their specialist. Laser removal is an excellent choice for anyone interested in having old tattoos covered up. Options include complete removal of the old work, and partial removal to enhance the options for the new work. Consult with your artist regarding which option is most well suited to your goals. The older your old tattoo is, the easier it will be to remove. Black ink comes out the easiest, and as the colors get lighter they become more difficult to remove. For example very light purple, white, yellow, etc. are nearly impossible to burn out. This isn’t all that important since the light colors are easiest to COVER-UP. In some cases, it is sensible to have your artist outline the new tattoo, and place all the black shading BEFORE you have laser treatment. This allows the maximum area of the old tattoo to be covered WITHOUT laser, leaving only the parts of your old work that are really “in the way” to be removed. I have seen where this approach can reduce the area needing laser removal by more than half. While it may slow down the overall time required to finish the new tattoo, it is a good option when advised by your tattoo artist, because healing a tattoo is a bit less traumatic than healing a laser removal burn. Be aware that Laser removal is a relatively time consuming endeavor for most jobs. Any old tattoo that is very dark will take several laser sessions to remove. Removal sessions must be spaced out at least a month apart, and once the removal process is finished it is wise to wait a minimum of SIX months before applying new tattoos to the affected area. Therefore bear in mind that any laser removal prior to cover-up will set the tattoo start date back by six months or more, so the time to begin laser removal treatment is NOW, not later.